Easy way for little kids to get involved in the pumpkin making fun. 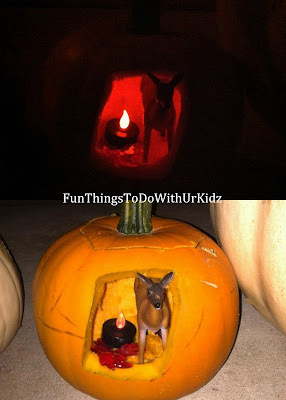 Just cut a window out of a clean pumpkin and let your little ones go wild creating different scenes. Ours was just a fall theme with fake leaves,light, and a deer but be creative. Maybe use skeletons, or animals. Anything your little ones might be into at the time.